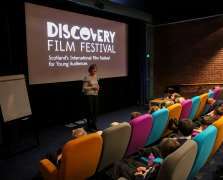 This collection of short films that we select for some of the youngest audiences at the festival has a life that goes on around the year (and around the country), but it is here at DCA where it first sees the light of day. Once again the stories we’ve chosen come from a whole range of different countries: this year we journey to France, the Netherlands, Germany, Sweden and the USA. 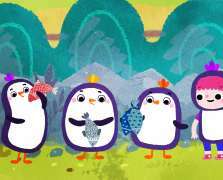 There’s a penguin whose attempts to serve drinks at a birthday party lead to utter chaos, a mystery fish who will only swim at the surface of the sea, and a little girl who insists on moving in to live with the animals at the zoo. A large green bird has some difficulties with a big bell and a very frisky egg, and we learn what happens when some dots start thinking (and eating) outside the box. Plus – and this is an absolute first for Discovery Film Festival – screen giant Samuel L. Jackson gives us his finest, funkiest, flashiest Tyrannosaurus Rex in a truly jaw-dropping, mind-boggling and foot-tapping four minutes! 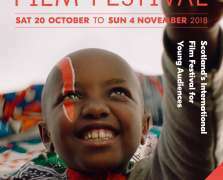 All these short films are in English or are dialogue free. These magical tales will delight children age 3+ and are a colourful introduction to the cinema experience as well as moving image literacy. If you’re not quite sure how these films can be used in your classroom, come to one of our hands-on CLPL sessions.